Most free templates that is developed with Twitter Bootstrap are for Wordpress and Tumblr blogs only. So I thought, why not create my own twitter bootstrap based template for Blogspot users like me. 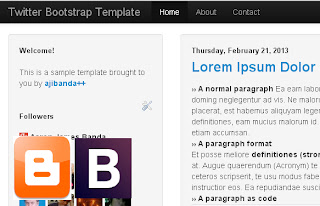 So, our target for today is to create our very own template for your Blogspot sites using Twitter Bootstrap. With the help of this framework, creating your own template takes only a few minutes and some creativity. This blog itself is an example of a template made out of the said framework. Uhm.. What is Twitter Bootstrap? Do I need to learn anything? err.. Coding? Well since we are designing for a website, coding is a must in here. BUT WAIT, don't be scared! we just need to rely on your basic knowledge about HTML and CSS. We don't need anything fancy in here. I'll keep the steps as simple as possible. For the complete file samples used in this tutorial, you can download it on the link below. We also provided a demo site for you to check on. NOTE: I'll try to make the steps as simple as possible so that every one can follow. What we are about to do is a simple two-column responsive design for blogspot - one column for the sidebar (a place for widgets) and one for the main theme. Start by downloading the framework's zip file. Since blogspot uses a single file for template, it is a must to upload the files you downloaded to an online file storage or server. There are lots of free online file storage, such as DropBox and Google Drive, for you to choose from. Download the resources above this post and open fluid.html using your favorite text/code editor such as notepad. This will be your base file for our template design. This is based on the default fluid design offered on Twitter Bootstrap's website with minor customization to emphasize the things we need to do later on. Note that a fluid design is actually a responsive design that adjusts itself based on the viewport of the browser. Meaning, it automatically fits itself in the browser even if it is resized. This prepares your site from being a plain HTML to a blogspot template. Note also that the DOCTYPE is now prepared for HTML5. This allows our template to switch title from the index type page and article page. For the description and author, you can simply fill it out for now with whatever your description is. The code above is required by Blogspot to be placed on your template. This is used as the basis of default colors for bloggers's widget such as AdSense and other links. It would be better if you can replace the colors later on but for now, we will just retain it as it is. You can place here all CSS customization such as changing the font-size, colors, background-colors etc. Note that the positioning of CSS files is important in web designing especially on twitter bootstrap. You can also replace or prepend it with an image if you like. As for the navigation itself, beginners can make it static for now. Just add your pages by editing the contents. Take note of expr before href. For the other links, just replace the href attribute with the proper link. No need to prepend expr. That should be it. Now save your file as myTemplate.xml. Back-up your existing template (just to be safe) then upload your very own customized twitter bootstrap based blogspot template. When uploading to either Google Drive or Dropbox, you get a dropbox/drive interface wrapped around your code. I want to get rid of this code. You simply just mention that this is possible, but I've been looking around the interwebs and I can not seem to find any of the files uploaded already, nor can I find any help as to how I upload them myself.